All images by Ashley Reese. The first things you notice are the uniform orange beanies, blazing like a sore, tangerine thumb against the dour grey smattering of a New York evening. Armed with name tags and press passes, manila folders and snacks, the student volunteers are buzzing with an excitement normally afforded to theater kids before a big show. Meet Coalition Z, a group of high school students pushing for a progressive agenda that matches their values. In the month since the Parkland shooting, that means challenging authority, by any means necessary. 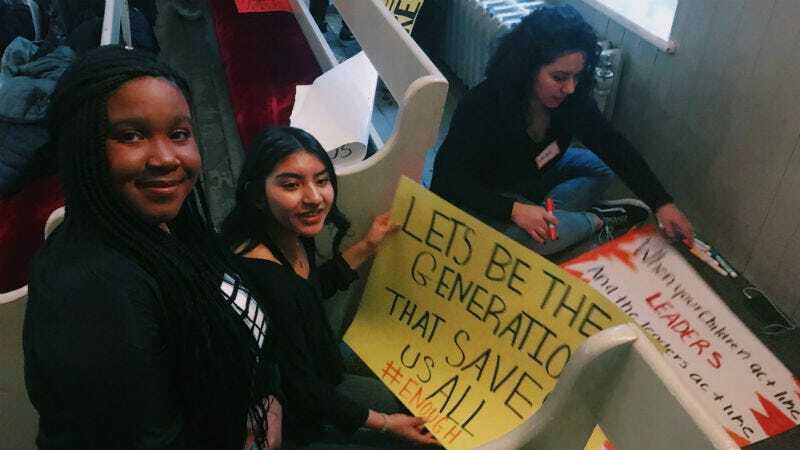 More than a hundred local students, parents, activists, and curious reporters gathered at a Quaker meeting house on Wednesday for what students had billed as an evening of action. It was a night dedicated to combating gun violence, reflecting on the horrors of the February 14 Parkland shooting, and bad mouthing the National Rifle Association. Speakers included members of Coalition Z, Marjory Stoneman Douglas alumni, Parkland shooting survivors speaking through a video chat, and a representative from Moms Demand Action, a gun control advocacy group. With most gatherings of teenagers, it’s typical to see their eyes fixed on their phones, scrolling through an endless cycle of Snapchat, to the group chat, to Instagram, back to the group chat, ad nauseam. But on Wednesday night, it was the parents who sat in the back of the church, chatting and eyeing their phones while their kids meandered around the building with their friends. A girl named Olive led a small troop of girls up and down the aisles; wearing high-waisted mom jeans and a top with the words “Time For A Change” written in black Sharpie. The place felt cool, like you were the weird one if you missed out on this opportunity to make anti-gun posters, talk about background checks, and potentially wind up on the local news. She wasn’t the only teenager who cited Sandy Hook as a turning point. But Parkland did, of course, weigh on these teens’ minds. After an hour of students designing posters and milling around the meeting house, participants gathered on stage as Sam Cooke’s “A Change Is Gonna Come” played softly in the background. Students gave speeches pressuring their peers to contact their representatives and register to vote. A woman who graduated from Marjory Stoneman Douglas in 1993 led an emotional moment of reflection for the victims of the Parkland shooting, noting that it was hard for her to imagine the carnage that took place in the same hallways where she hung out with her friends. Then, in a moment that really solidified the way that tech and social media have helped propel this student-led anti-gun movement across the country, two survivors of Parkland—Ryan Deitsch and Delaney Tarr—interacted with the audience via Facetime, their faces bright in southern sun. There was a brief lick of tension when one of the speakers—a woman from Moms Demand Action—admitted that she was, in fact, a card carrying member of the NRA. Just behind her hung a sign that screamed “NeveRagAin.” But her comment was largely defused when she mentioned that most NRA members support stronger gun control, and she held up a photo of her nephew, who was shot and killed in 2008 at the age of 19. The woman, a former marine turned activist, emphasized that gun violence doesn’t just affect young people in schools, but in their communities as well. This sentiment was echoed by Kopp, a highlight of the night who took the stage toward the end and managed to engage a crowd that was already shifting in their seats, reaching for their coats, itching to wrap up the two-hour event. She made the room hum. Kopp also emphasized the fact that children feel failed by the adults that are supposed to protect them. It’s such a cliche to note a teenager’s eloquence, but Kopp was magnetic and natural; she spoke to me with the same fortitude that she did on stage, her tone lacking that sing songy lilt or the clipped, almost rehearsed pentameter that some—young and old—fall into. The Walkout Was a Serious Risk For Many Students. They Did It Anyway.